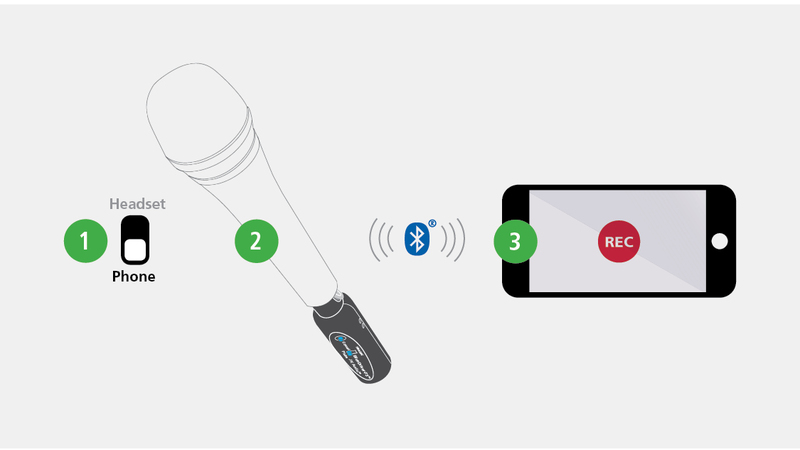 Mic or Mixer output to your Bluetooth Device. Pair to your Bluetooth enabled phone, headset, or speaker to route audio through your Bluetooth device. New to BlueDriver-F3, the 3.5 mm stereo output jack is now a headphone output jack, allowing you to monitor the return signal from your Bluetooth device over wired ear buds or headphones. Pair BlueDriver-F3 to your Bluetooth headset or speaker. BlueDriver-F3 functions like a phone to send and receive audio from a Bluetooth wireless headset, or transmit audio to a Bluetooth wireless speaker. Pair BlueDriver-F3 to your phone to capture wireless Audio-for-Video, make a live call into the station, or bring caller audio into your live event or podcast. BlueDriver-F3 along with a professional video camera app, lets you record broadcast worthy interviews while placing the mic in the subjects hand for improved audio quality. Plug BlueDriver-F3 into the bottom of a dynamic microphone. Pair to a cell phone. Enable the Bluetooth-Mic input in the in-app settings and start recording. Note:Your built-in camera app may not currently support a Bluetooth microphone. Visit www.jkaudio.com/audio-for-video for a list of compatible apps for iOS and Android devices. Plug BlueDriver-F3 into the bottom of a dynamic microphone and pair to a cell phone. This setup allows voice band, bi-directional audio to and from your cell phone. Place or take a call. Dial into the station for live remote broadcast. The <Rec> headphone output can provide an outlet for listening to your voice as well as the return audio from the cell phone. You may have the finest IP CODEC available, but if the internet goes down, there goes the remote. Simply plug BlueDriver-F3 into the master audio output of your mixer or CODEC. Pair to your cell phone which is dialed into the station. This setup allows voice band audio, through your cell phone, back to the station. The mini cable provided with your BlueDriver allows you to connect the <Rec> output from the BlueDriver-F3 to an unbalanced mono or stereo input to allow for monitoring the return audio from the station. 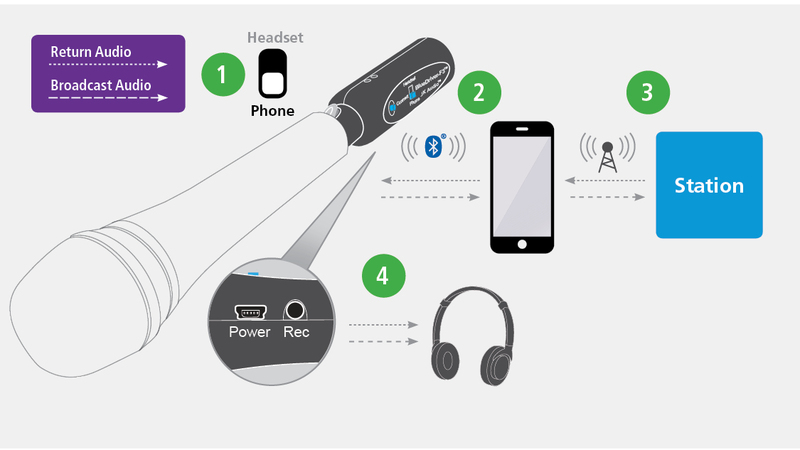 The “Headset” mode of BlueDriver-F3 connects to Bluetooth headphones or wireless speakers, and provides full 20 kHz audio bandwidth A2DP audio. 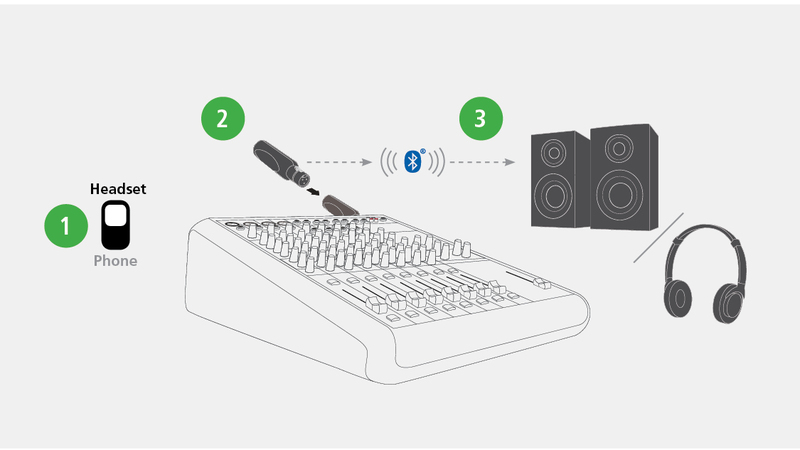 Simply plug BlueDriver-F3 into the audio output of your mixer or playback system, Pair to your headphones or speaker. 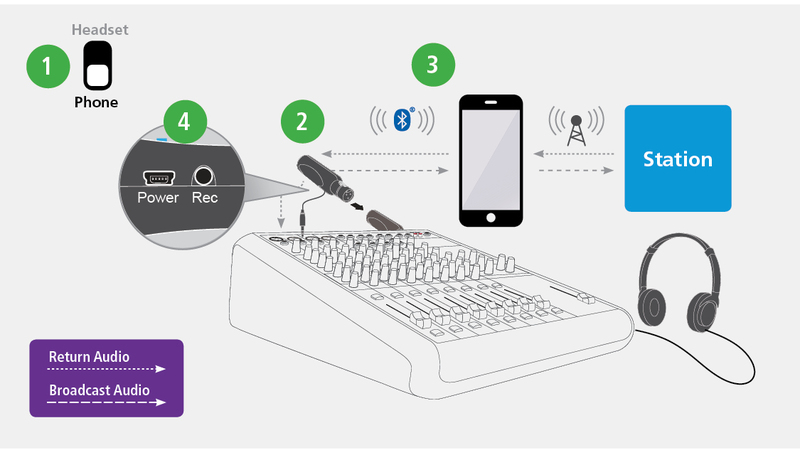 Keep in mind that Bluetooth A2DP processing adds a 150 millisecond delay, so this application is more appropriate for pre-recorded or broadcast applications that do not have a live mic or interactive conversation. Also keep in mind that the 3 pin XLR is a balanced mono connection. 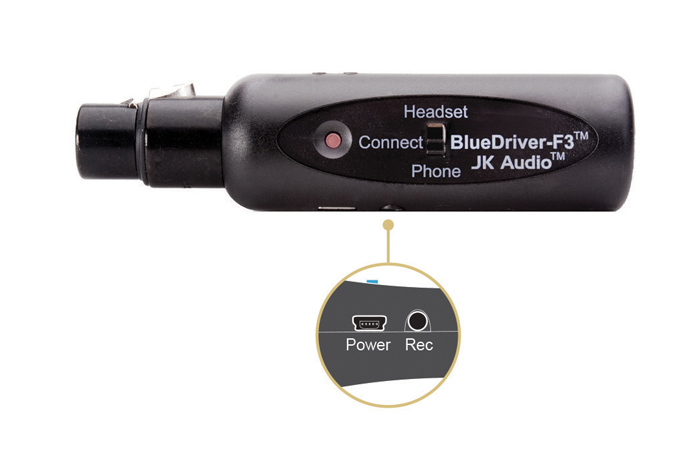 BlueDriver-F3 sends the mono XLR signal to both left and right channels of the Stereo A2DP Bluetooth signal. A2DP is a one-way transmission, with nothing coming back on the return channel.